The Tulsa Drillers early season struggles with the Arkansas Travelers continued Thursday night in North Little Rock. The Drillers were held without a hit for the first five innings and fell to the Travelers 9-8. It was Tulsa's fourth loss in five meetings with Arkansas this season. The defeat also ended the Drillers four-game winning streak. The Travelers, who were playing in their home opener, got all the offense they needed in the bottom of the second inning. Drillers starting pitcher Yadier Alvarez alternated a pair of walks and a pair of strikeouts to put runners at the corners with two outs. The Travs executed a double steal with Chris Mariscal swiping home to plate the first run of the game. After another free pass from Alvarez, Jake Fraley delivered his first home run of the season, a three-run shot that gave the Travelers a 4-0 advantage. In the fourth, Arkansas loaded the bases with one out against Tulsa reliever Yordy Cabrera. Nick Zammarelli plated a run with a ground out before a wild pitch brought home another to up the Travs lead to 6-0. Tulsa's first hit of the game came in the sixth inning on a one-out triple from Gavin Lux. Lux came home with the Drillers first run on a ground out from Zach McKinstry. The Travelers responded with two more runs in the bottom half of the sixth to make it 8-1. 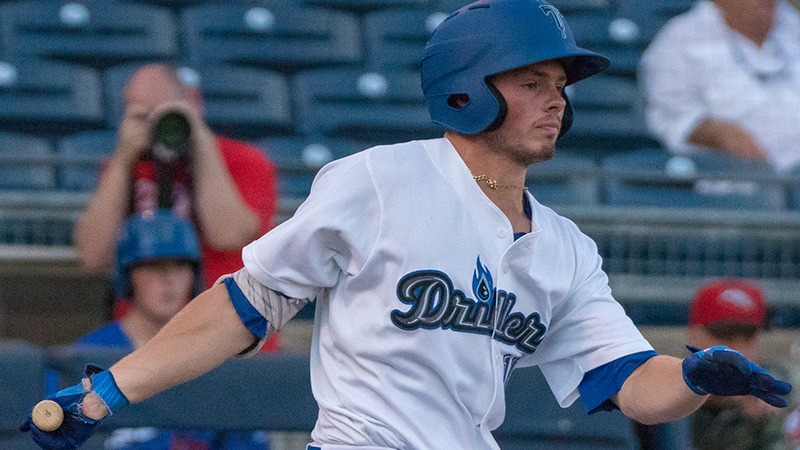 The Drillers made things interesting with four runs in the top of the eighth, matching their biggest inning of the season. Doubles from Jared Walker and McKinstry produced the first run. Cristian Santana singled home another run before Chris Parmelee tripled home to more to cut the Arkansas lead to 8-5. The Travs again answered with a ninth run in the bottom half of the eighth, but the Drillers would not go away. In the top of the ninth, Lux singled home a run before scoring himself on a triple by McKinstry. A run-scoring ground out from Keibert Ruiz brought Tulsa to within one run at 9-8. When DJ Peters singled to extend the game, the potential go-ahead run came to the plate, but Arkansas reliever Art Warren retired Santana on strikes to end the game. It was a tough night for Alvarez. The right-hander did not escape the second inning, allowing four runs on two hits, three walks and two wild pitches. The outing dropped his record to 0-2 and increased his season ERA to 14.73. *Catcher Josh Thole was assigned to Triple-A Oklahoma City prior to Thursday's game. To replace his spot on the roster, the Drillers received catcher Steve Berman from Class-A Rancho Cucamonga. *Omar Estevez did not play in the loss, keeping his hitting streak active at seven straight games. Lux and McKinstry extended their hitting streaks to six games. *Thursday's game was Tulsa's first away from ONEOK Field this season. *Arkansas starting pitcher Zac Grotz did not allow a hit in four shutout innings. He did not walk a batter and struck out six. UP NEXT: Tulsa at Arkansas, Friday, April 12, 7:10 p.m. at Dickey Stephens Park in North Little Rock, AR. TBA vs. LHP Anthony Misiewicz (0-1, 1.69 ERA).